There’s nothing like a change of scenery and salt air to inspire group collaboration and creativity. In Virginia Beach, team-building is taken to new heights with a variety of exciting activities and attractions ideal for team adventures beyond the boardroom. The Adventure Park at the Virginia Aquarium, an outdoor, aerial adventure park featuring multiple zip lines and rope courses that vary in difficulty, is the first-of-its-kind in Virginia. Group rates are available for parties of 10 or more with an advanced reservation. 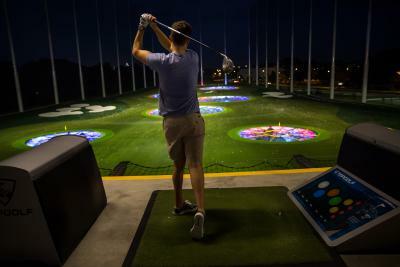 Challenge your group to an addictive game of TopGolf at its brand-new location near Virginia Beach’s Town Center. The state-of-the-art venue features 102 golfing bays across three stories, in addition to a full-service bar and restaurant, meeting space, billiards, shuffle boards and an Xbox lounge. Those seeking thrills of even broader heights will love iFLY Virginia Beach, the city’s first indoor skydiving complex. Schedule a meeting in their 24-person boardroom, then head over to the wind tunnel to experience the thrill of skydiving. Located in the heart of the resort area, the facility’s state-of-the-art wind tunnel helps create variable wind speeds in excess of 180 mph, providing the sensation of a free-fall, as trained instructors guide flyers through a variety of fun maneuvers. Those planners looking to immerse their groups in earthier adventures can schedule a Pleasure House Oysters’ oyster-farm boat tour to learn about the legendary Lynnhaven oyster and see first-hand how the bivalves are harvested. In addition to providing an environmentally friendly and fully immersive team-building experience, Pleasure House Oysters also offers a unique Chef’s Table experience served up right on the Lynnhaven River. Farther south in Pungo is New Earth Farm, a working, sustainable and educational 21-acre farm growing all-natural, chemical-free produce and products that are shared and sold within the community. 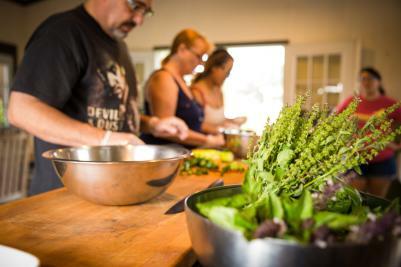 The farm is proud to provide on-farm participatory cooking classes to advocate and help educate visitors about healthy, responsible and sustainable food.